1. INCREASE HEALTH, a sense of wellbeing, and overall quality of care – addressing mind, body, and spirit. The highest practicable level of wellbeing. 3. REDUCE LONELINESS AND INCREASE COMPANIONSHIP -- Social isolation and loneliness is a major health risk, worse than chronic illnesses or substance abuse. LifeBio makes visiting with older people easier by using their own life stories as a conversation starter and connection point. 4. INNOVATE IN MEMORY CARE -- Provide the best in memory care, programming, and life enrichment activities for seniors with cognitive challenges. 5. MAKE BETTER VISITS HAPPEN - Increase access of seniors to youth, adult volunteers, and family members. 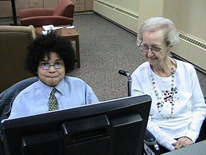 More intergenerational interaction affirms lives and gives seniors an opportunity to teach and inform the next generation, sharing wisdom and lessons learned through the years. 7. RECORD THE LEGACY - Ensure the life story is told – the legacy is captured for all time for the person and their family. The priceless memories of this unique individual should not be lost or forgotten. Impress family members and other caregivers with your appreciation of this person’s life. 1. Web – Gain premium access to www.lifebio.com for your organization’s participants. Any web-based PC, laptop, or tablet can be used. 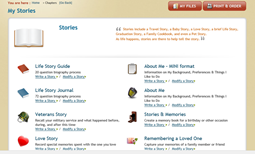 The senior and/or his family, staff member, or volunteer can access LifeBio.com to build a short “Story" (in as little as 30 minutes) or a long “Biography" using LifeBio’s easy-to-use online biography templates. 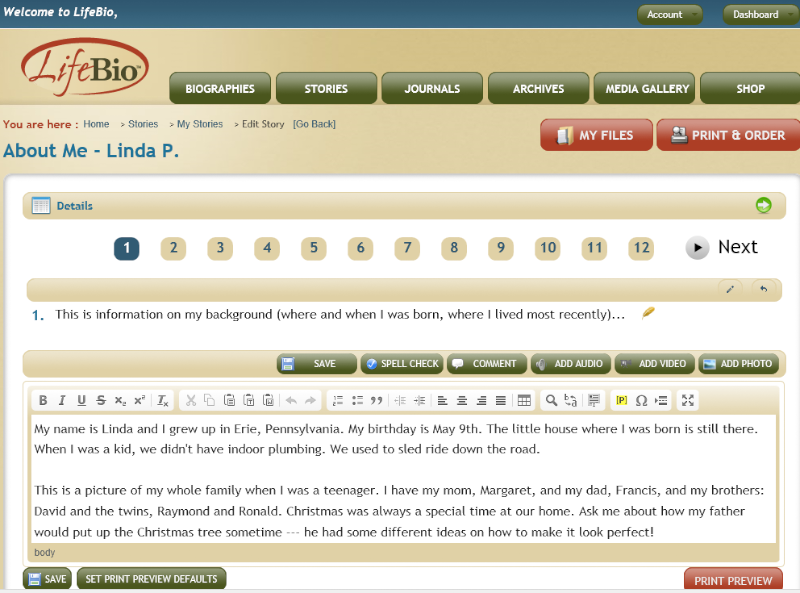 Photos, videos, family history data and more can be added and stored inside LifeBio. Information can also be viewed or printed on demand, to make the life story available for staff, family, or others to learn more about the whole person. 2. 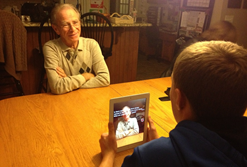 App – Record videos of the senior sharing his or her life story using the LifeBio Studio iPad app (and soon the app will be available for both Windows Mobile and Android as well). If typing or writing isn’t a good option, the LifeBio app now makes it easy to just speak the story and have it saved into the “LifeBio Cloud" for safekeeping and viewing later. LifeBio Studio prompts the participant to share their story with a variety of templates to video record more about his or her childhood, school days, work experiences, family relationships, and more. 3. Journals – LifeBio’s "low tech" options such as journals give a variety of formats for capturing life stories in writing. The "Life Story Guide" takes the biography a step further with 20 essential questions to know more about the person’s background and experiences. For those who may want or need a more detailed process, the “Life Story Journal" or the “Memory Journal" are used with active seniors who may want to work in a group and take a LifeBio 101 class together. 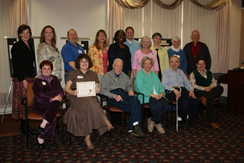 Group LifeBio 101 classes promote engagement and companionship, helping build stronger relationships between seniors as they learn more about each other. As a LifeBio Authorized Organization, LifeBio will even assist in typing information into www.lifebio.com from the book format. 4. 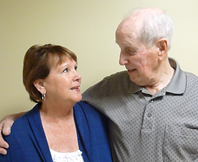 Memory Care Tools – LifeBio’s “About Me" template on the web is a very simple way to learn more about a person immediately upon engagement or move in. Family members can complete this simple “About Me" bio using the private and secure LifeBio website. This non-clinical tool for gathering the life story helps to build a relationship and helps professional caregivers and nursing staff to see the whole person. LifeBio also provides MemoryBio, a specialized approach for visiting with those who have mild cognitive impairment, Alzheimer’s Disease, or other related dementias. MemoryBio offers a photo-based way to reminisce using over 200 photos covering 35 themes of everyday life. MemoryBio also includes easy-to-pose questions to generate discussions. MemoryBio Journals are available to record new information learned during 1:1 or small group discussions.